Our trip to Belize in November, 2018, was full of adventure. 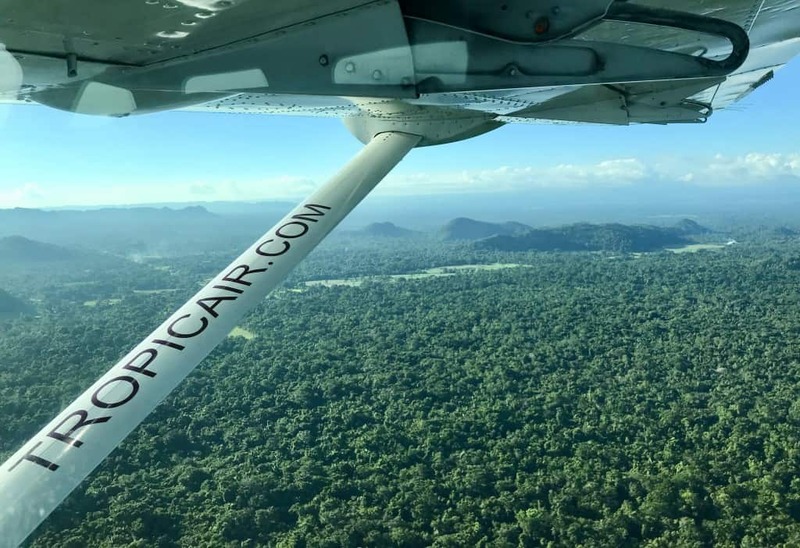 As I’d mentioned in this introductory post, we flew into Belize City, and then took a small plane to the southern tip of the country to begin our cacao adventure in Punta Gorda, the Cacao Capital of Belize. Flying in the small propeller plane of Tropic Air gave us the opportunity to fly low above the jungle as we arrived in Punta Gorda, Belize. Located in the Toledo District of Southern Belize, Punta Gorda is a small centre of just over 5,300 residents. We were to use that as our base for three nights as we explored the area. We stayed at the Coral House Inn, a lovely six-room boutique property located right on the Caribbean Sea. 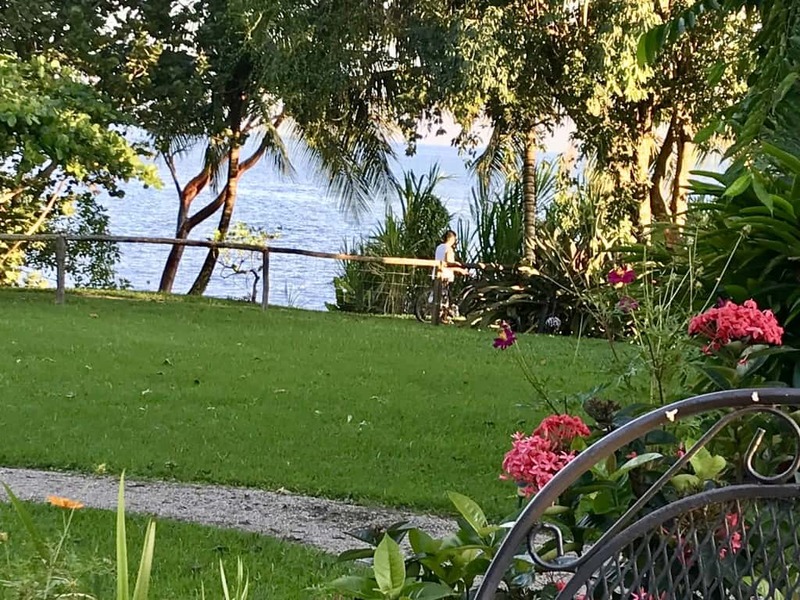 We enjoyed the natural seaside setting with nicely landscaped grounds populated with flowers, birds, and a couple of resident cats. There was a small pool, open bar with payment via the honour system, and breakfast included with our room. Serene and relaxing. We really enjoyed our time at the Coral House in Punta Gorda, Belize. I must thank my friend Virginia, who has accompanied me through seven countries (to date) where we have explored chocolate and cacao as research for Chocolatour. Her love of adventure and positive spirit make our chocolate adventures so much fun. 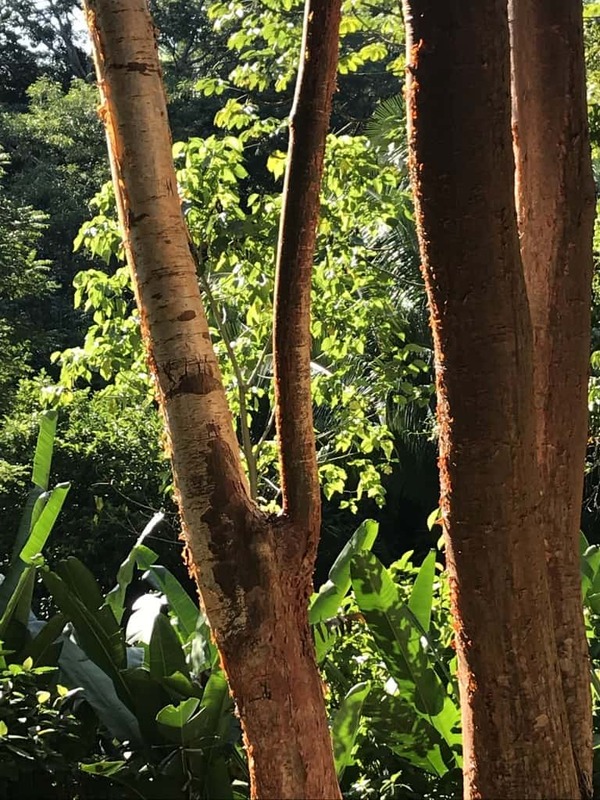 I’ll devote a couple of future posts to what we learned about growing cacao in Belize and the delicious chocolate we tasted. But in this post, I’ll highlight two fantastic tourist attractions that a visit to Punta Gorda really should include. Two million Mayans once populated the area known as Mesoamerica as early as 2500 BC. They migrated to Belize in about 250 AD, so it is no surprise that there are at least 12 sites where Mayan ruins have been excavated. 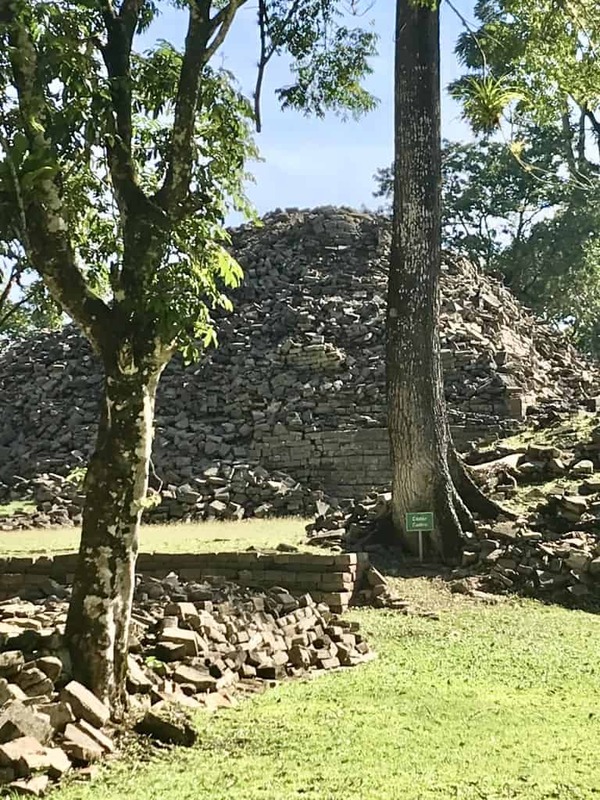 The one closest to Punta Gorda is called Lubaantun (translated as ‘the place of the fallen stone’) which dates back to 750-850 AD at which time the village had a population of approximately 1,000,000 residents. Lubaantun is a Mayan ruin located near Punta Gorda, Belize. We were told it had been dynamited in search of treasure, and that is why it is not as well preserved as some Mayan sites. Excavation and restoration is a work-in-progress. I was mesmerized by the sun streaming through the Gumbo Limbo trees of the jungle surrounding Lubaantun. The trees are called “tourist trees” in Belize as their peeling bark resembles the peeling burned skin of tourists. Allow yourself the better part of a day to get to Lubaantun and explore the grounds at your leisure. Be aware that it involves a pretty hefty hike to get from the parking area up to the site of the ruins. Local Mayan people sell their handcrafts near the interpretive centre at reasonable prices. Another stop to visit that is not too far from Punta Gorda is the Belize Spice Farm & Botanical Garden. This is a full service facility with a lovely restaurant, gift shop, and tram that you can take to tour the grounds if you choose not to walk or are short of time as we were. 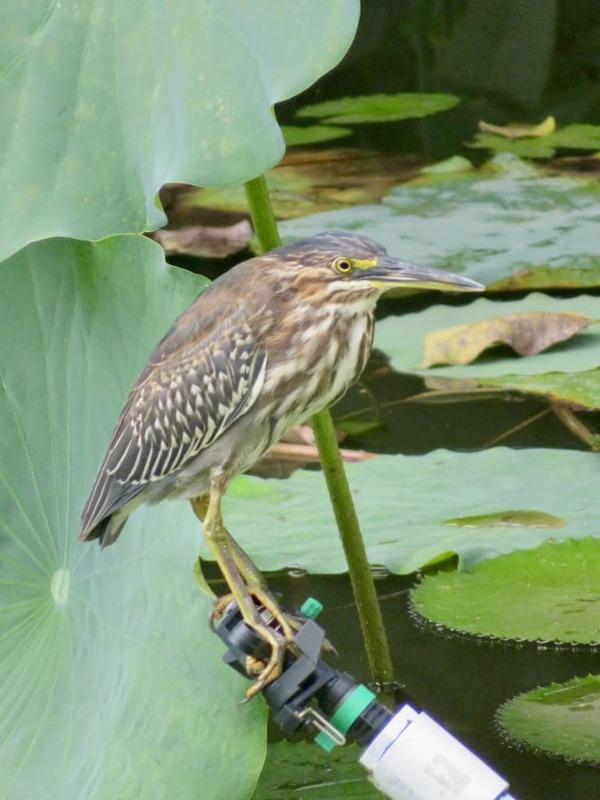 This bird was enjoying the peacefulness of the lily pond at the Belize Spice Farm as much as we were. The Belize Spice Farm was the dream of Tom and Tessy Mathew, American expats originally from Kerala, India, who started their Golden Stream Plantation by growing cacao and orange trees. Today, that plantation has grown to a 500-acre property that has 400 acres of oranges and hundreds of other plants including a wide variety of tropical flowers, spices, and trees. The highlights for me were the massive lily pond and the lotus garden. 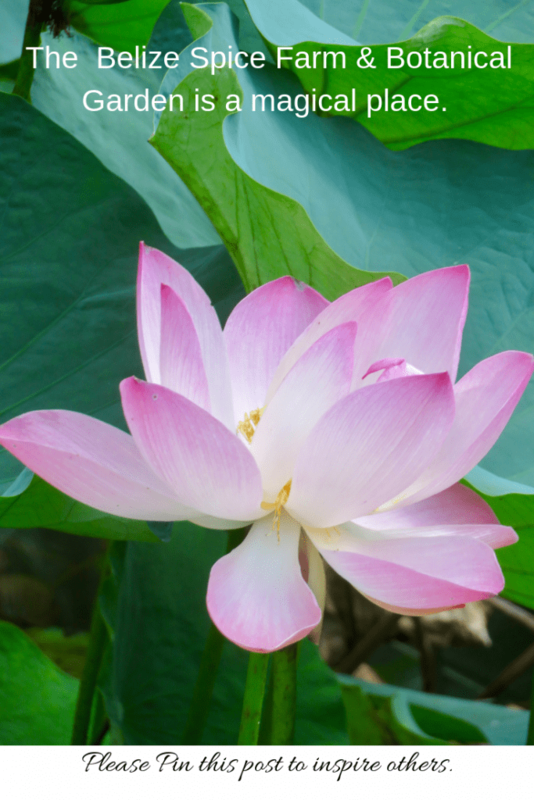 Shown below are the pink lotus. It was incredible being surrounded by them. 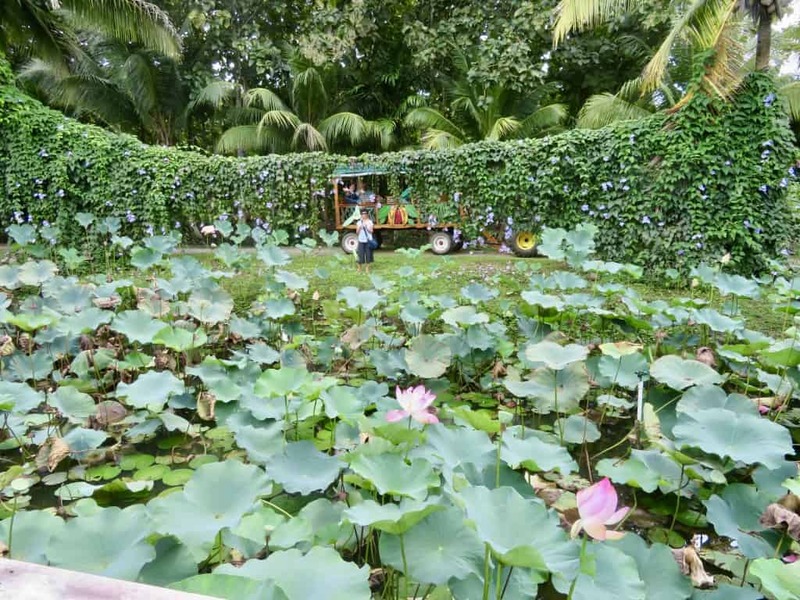 The lotus garden at the Belize Spice Farm was beautiful. I hope you will find the opportunity to visit Southern Belize and the Punta Gorda region. From this post, you have learned of a nice place to stay and two major attractions in the area. Stay tuned for more about the chocolate and cacao of Belize. DId the breakfast have cocoa or chocolate with it? No, but we did score a fab prawn dinner served with chocolate sauce. Stay tuned for post on that! I imagine the spice farm was very aromatic. What a cool place to visit. Hi Jan. You would love the spice farm! I didn’t have time to get into more detail here, but it’s a super incredible place for food & plant enthusiasts. So beautiful ! It would be great to make that trip sometime when visiting the “Mayan Riviera”. I love flying in small planes and being able to see what’s below. You and Virginia always have such a lovely time. Great travel partners ! Thanks so much for this, and for your lovely photos. Thank YOU, Linda, for truly getting what I do & who helps make it happen. Thank you, Doreen, for including me in your adventures once again. Belize was such a fascinating place in ways I didn’t expect – such an interesting mix of cultures and natural wonders. And as your photos depict, the diversity of trees and plants alone made it worth the trip. Very cool, Carol. Where is your timeshare? I will be writing about Placencia in an upcoming post where there are a number of timeshares. We’ve visited Belize some years ago but not that area. Sounds like the combo of cacao/oranges/spices is a natural as would be a visit to the spice farm and botanical garden. We’re chocolate lovers and will look forward to your article(s) on the chocolate of Belize. Belize is a tropical destination that is still on my list! Although I’d like to go there to check out the scuba diving, I also enjoy visiting botanical gardens and other land-based attractions. Hopefully, I’ll make it to this area when I finally make it to Belize! Indeed, Debbie. The snorkelling and scuba diving in Belize are excellent. It is a wonderful choice for you to visit. Beautiful post, simply detailed your thoughts and the sights you visited and that was great. I love to hear this kind of travel stories. The pictures included in your article is also communicating the natural beauty of Belize. This seems like a nice place to relax and rejuvenate. Would love to explore Central America in future. I have really loved what I have seen in Central America, which so far includes Belize, Costa Rica, Guatemala, and going thru the Panama Canal. I like how your photos present us the nature (so cute tiny bird by the way!). I have yet to visit Belize but your writing inspired me more, thanks for sharing your coco (and not only!) stories! Thank you, Val, and welcome to Chocolatour! That bird is actually not that tiny! It was the size of a kingfisher, and may in fact be of the kingfisher family. Yes, Belize is a truly lovely country. I’m so grateful I’ve now had the opportunity to see a very large part of it. What a lovely and relaxing time you had in Punta Gorda. We have friends who snowbird to Belize during the winter and we see from your photos that we need to visit them. 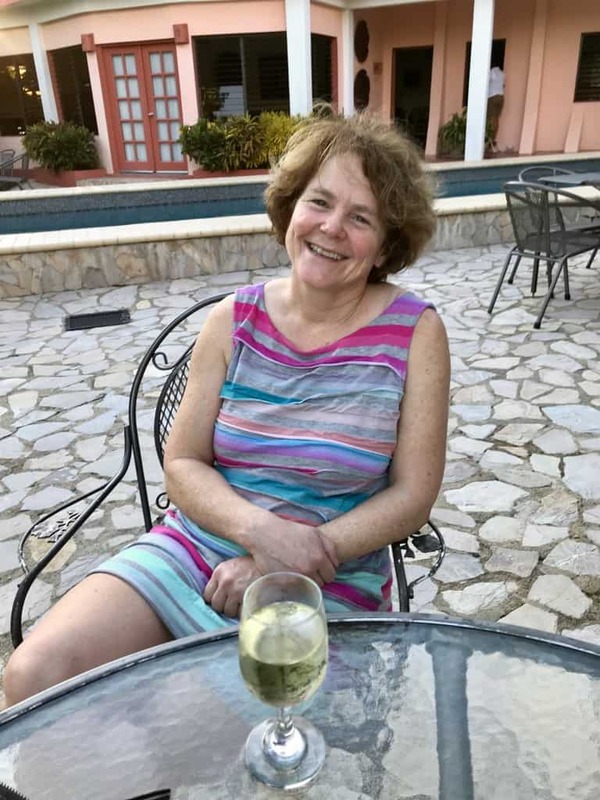 Doreen, you’ve made Belize sound more wonderful than other friends who have been there. It’s beautiful and the people sound nice, and the ruins are interesting. Hi Michele. Yes, it certainly looks like there is a lot of work ahead in restoring those ruins. I’ve been to a number of Mayan ruins now and it’s quite fascinating seeing each one in a different state of repair/ill repair! I’d love to visit Belize. If I do, the Spice Farm and Botanical Garden will definitely be on my list. I love, love, love the look and sound of the spice farm! What an incredible place to visit! Hi Priya. Yes, I was pretty thrilled with our visit to the Belize Spice Farm and Botanical Garden. I hope you get to visit sometime soon. Coral House has such a beautiful setting and Lotus Garden is pretty. It is rather cold and grey here in the UK – worlds apart! Looking at the photographs has reminded me how much I miss the sun. Thank you for giving us a history trip. Hi Phoenicia. It may be chilly in the UK right now, but we’re having a Polar Vortex here on the Canadian Prairies and have temps in the range of -25-30C for much of this month. I, too, wish I was in a tropical paradise like Belize right now! It looks like you enjoyed a beautiful experience! The guy I dated in college used to visit his grandmother there in the summers and he loved it. Indeed, Danielle, and welcome back to Chocolatour! We haven’t seen you here in a very long while. Belize is definitely a destination that is easy to love. Yes. It’s been quite a while, but I’ve found my way back. Hopefully I can take a trip to Belize or take my new little one when he’s older. Congrats on the new little one! That explains your absence. 🙂 Yes, there really are a lot of family things to do in Belize. I will be doing a post on the great zoo (animal refuge) they have near Belize City, and the water sports (snorkelling, diving, etc.) are incredible! Do stay tuned! Yes. He has kept me busy . Oh, I love water sports and the zoo would be a hit. I am looking forward to your post! I so enjoy ‘tagging along’ on your chocolate travels. . .this one in particular had me wishing I had been along in person. Loved the tropical feel you captured in your photos! Nice! I miss your blog posts on your chocolate travels. I am back now! what an awesome time you had in Punta Gorda. It looks like an incredible place to visit. Hello Chin, and welcome back to Chocolatour! You will find many new posts since your last visit. I hope you will have a look around. Cheers and all the best for 2019. Belize looks like a beautiful country to visit. And I absolutely love the idea of prawns with chocolate sauce! Hi Karen. Yes, I’m quite surprised how cacao and chocolate seem to go with so many foods. The chocolate sauce, which was made from locally produced chocolate made from locally grown cacao was truly awesome! What a cool place to visit. How did you find this place ? Hello Sheena. I was invited to Punta Gorda to investigate the cacao there. I requested to visit something Mayan as I know Belize has a big Mayan culture. And the Belize Spice Farm was recommended to me by a friend. The property is indeed amazing. The views across the lawn to the sea are so refreshing. I would love to stay here any day. When I get a chance to visit Belize, i will definitely check this one out. Hi Neha. Yes, the Coral House was a lovely surprise. So relaxing an unpretentious. We loved it. The place looks magical and very soothing. The Spice Farm sounds just the place that we would love to visit. I am sure you enjoyed the trip immensely. Indeed, Amrita. The Belize Spice Farm and Botanical Garden is truly a soothing place. I loved it! The post made for fascinating reading. What really had me riveted was reading about the Mayan sites in the region. Was not aware of traces of Mayan civilization in this area. The Spice farm too looks interesting, and again my interest was piqued to see that the owners originate from India. Hi, Sandy. Yes, we are all one global nation, aren’t we? That’s what makes travel so fascinating. It helps us realize that. Very Nice! I miss your blog posts on your chocolate travels. I am back now! What an awesome time you had in Punta Gorda. Thank you for sharing. Very Nice blog posts on your chocolate travels. What an awesome time you had. Thank you for sharing.